Every day of a sumo tournament concludes with a bow-twirling ceremony, called yumitori-shiki in Japanese. 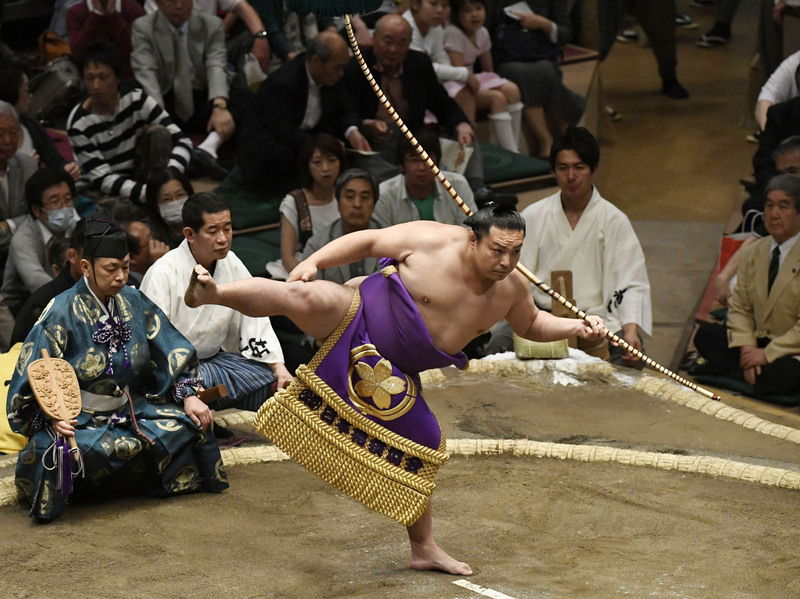 A rikishi — normally from the makushita division — mounts the dohyo from the side of the winner of the final bout and is handed a traditional bamboo bow (minus the string) by the gyoji. The kesho-mawashi (ceremonial apron) he wears is not his own, but belongs to, and has the logo of, the Japan Sumo Association. In Osaka it is one given by the Tozai-kai, a supporters group that can be seen ringside each day in traditional brown sleeveless jackets. The rikishi then performs a series of movements. If at any stage the bow is dropped, it must be picked up with a foot rather than a hand as touching the ground symbolizes a defeat. In March 2010, however, Minanosato, after several failed attempts to lift the bow with his foot, used his hand to pick it up. That wasn’t as bad as the time about 15 years ago when a wrestler misplaced the kesho-mawashi and was running around in a panic before the ceremony. He was given another one just in time. The original wasn’t stolen as first feared, but just under a pile of stacked boxes. A bow was one of the prizes given to tournament winners in the 1700s and back in those days the recipient would perform the ceremony himself. 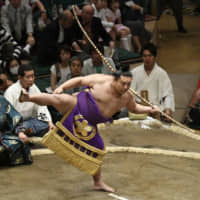 Oga, a rikishi from Takasago Stable, was considered particularly adept at the yumitori-shiki and continued to perform it even after his promotion to sekitori status in 2006. Twenty-nine-year-old Kasugaryu is the current incumbent.